Designers and Manufacturers of America's EZest to Operate Futon Frames. Restore America's Promise One Purchase At A Time. We truly are the futon EXPERTS! Our extensive selection of finished and unfinished pinewood and hardwood futon frames gives you a ton of frame options and styles to choose from. Our line of Southern Yellow Pine futon frames includes several L-frame and A-frame designs for economy and efficiency, as well as sleeper sofa bed frames, loveseat futon frames, and futon lounger frames in Chair size, Twin size, Loveseat size, & Full size. Our hardwood futon frame designs are gorgeous and your choices are almost endless. Whether you're looking for a single futon frame solution or an entire living room futon package, we have innovative and highly functional futon designs to suit your needs AND budget! 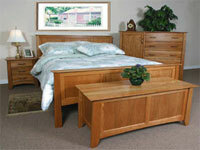 Room Doctor's solid wood platform beds feature beautiful wood grains and are easy to assemble. All of our Oak and Southern Yellow Pine platform bed frames are made of 100% natural clean wood, with no chemicals or preservatives used. You can leave your platform bed unfinished, or choose from a variety of water-based stain options to enhance your bed frame's natural beauty. 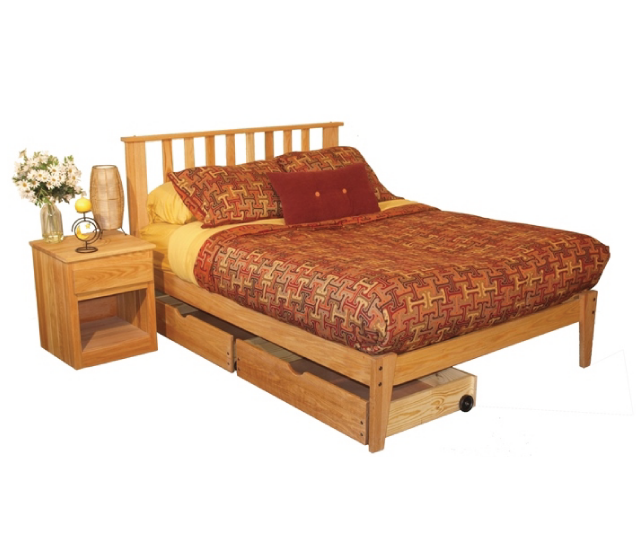 None of our solid wood platform bed frames require a boxspring! You can purchase your platform bed alone, or with matching bedroom furniture and underbed storage solutions in Southern Yellow Pine. Room Doctor has gorgeous finished hardwood and unfinished southern yellow pine bedroom furniture suites to suit any taste and decor. Solid Oak, Maple, Ash, Cherry, and Pine woods are available in many different styles and finishes. Buy the perfect platform bed suite, complete with dressers, regular and underbed storage drawers, armoires, mirrors, and more. Some models even come with optional trundle bed! Make your bedroom just the way you like it at the Room Doctor. 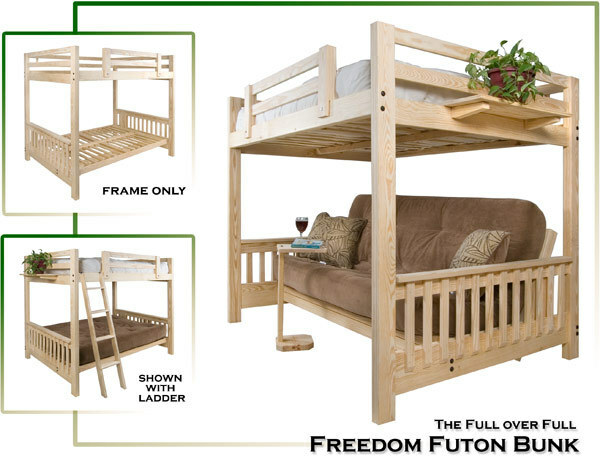 Futon bunk and loft bed frames are a Room Doctor specialty. Our space saving bunks and lofts come in a variety of frame configurations and styles to suit any need. 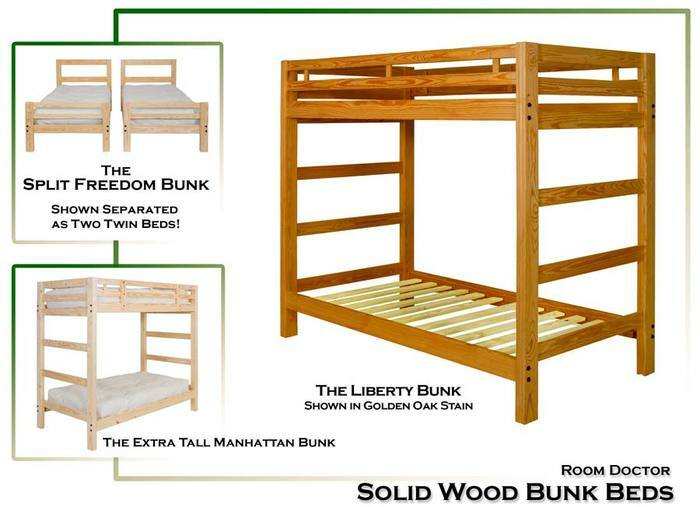 If you are a college student in need of a bunk bed, loft bed, or a loft & desk combo for your dorm room or apartment, then you've found your very own bunk and loft headquarters! 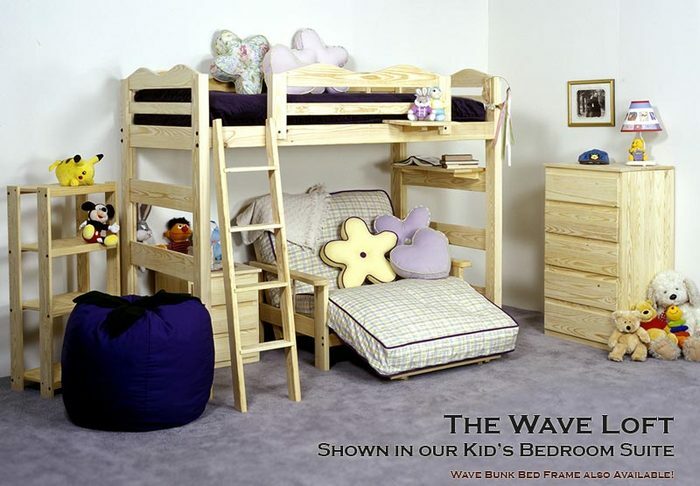 If you are a parent looking to shape up the kid's bedroom with efficient sleeping and storage solutions, look no further. 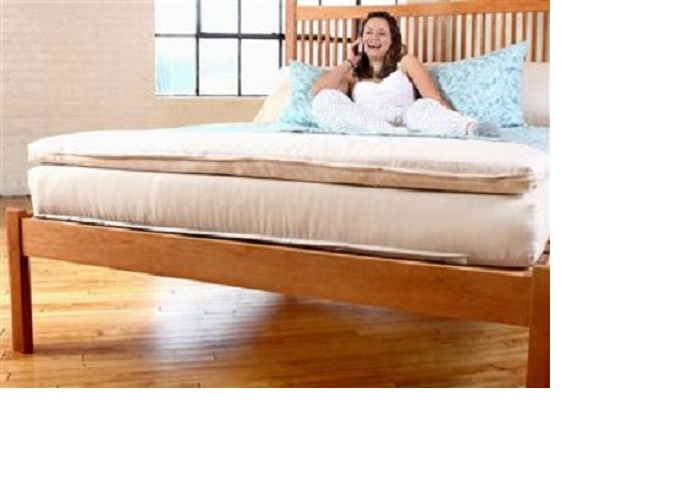 Our futon mattresses and spring mattresses are perfect for bunk beds or loft beds too. We work very hard at the Room Doctor to research and select the very finest futon mattresses and innerspring mattresses available to keep you sleeping in style and comfort. Every futon and innerspring mattress variety we offer has been chosen carefully to provide you with value, comfort, and durability at every single price point. Mattresses do not have to be outrageously expensive to provide you with superior quality for everyday sitting and sleeping. 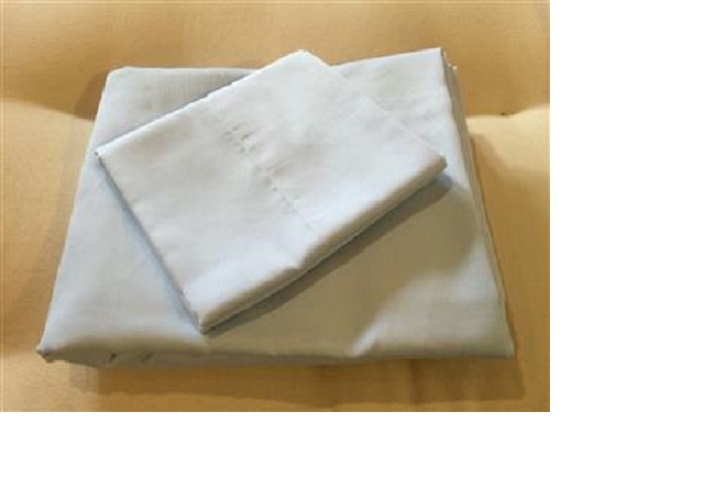 Whatever your price point, rest assured that the Room Doctor has a fantastic futon or mattress solution for you and your loved ones. Nobody sells better quality conventional futons and mattresses for less. Sick and tired of cheap particle board furniture that bends and bows from the get-go? 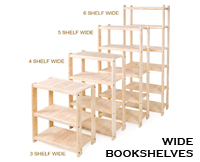 Do you need solid wood bookshelves, tables, or entertainment center shelving solutions that will stand the test of time? Then don't throw your money away at the local Target-Mart!!! Our Southern Yellow Pine tables, TV shelving and bookshelves are 100% natural, clean solid wood. In fact, we offer a full range of Pine, as well as Oak and Maple hardwood! 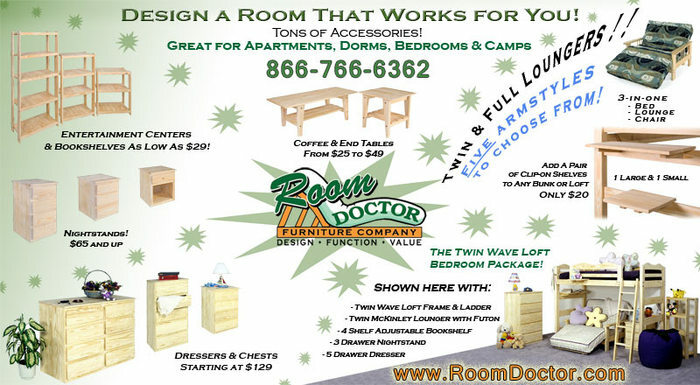 Quality and value go hand-in-hand at the Room Doctor Furniture Company. 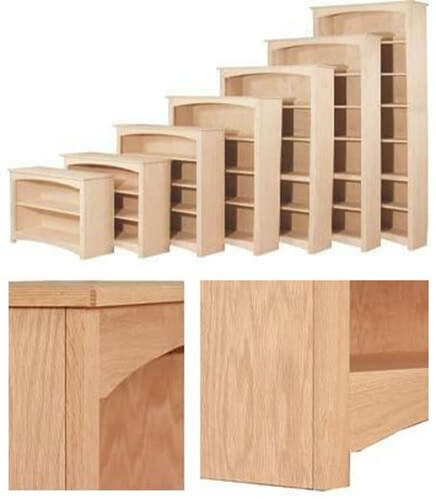 With our solid wood tables and shelving solutions you won't sacrifice one for the other! The World's Most AFFORDABLE ECO-FRIENDLY Furniture!